Before Greenlight, nobody was really sure how the selection of Steam games worked. Confidentiality agreements and Valve’s inherent secretiveness mean there’s not much information floating around about what metrics Valve use to select games for release; aside from the odd snippet, like Vic Davis having his games refused because they were “not a good fit”, and Valve’s repeated refusal of various pinball games because apparently nobody wants to play pinball games on a PC1 despite titles like Zen Pinball and Pinball Arcade selling by the bucketload on the consoles, there’s not a huge amount to go on. Profit motive is clearly a factor because Steam isn’t a charity, and unless you’re a pinball game Valve are at least not remotely snobbish here: if your game experiences a decent level of commercial success away from Steam then your chances of getting onto the service are that much higher because Valve can smell the huge piles of money to be made. However, this isn’t a huge help to indie developers operating on shoestring budgets, who may not necessarily have the cash on hand to nurse a game through the difficult early stages of its life to the point where Valve finally relent and open up the Steam gates. This is partly the reason why the Greenlight system was introduced. It’s a way for indie developers to prove there’s a significant demand for their game without having to go through the hassle of actually demonstrating this in the marketplace. It’s also a way of taking some of the pressure off of whoever it is at Valve who trawls through the Steam submissions, because the service – and the indie PC scene — has grown to the point where they can no longer effectively curate it in-house. People vote for the games they want to see on Steam. Once a game has enough votes Valve will take a look at it, and if they like what they see they’ll give it a free pass and put it on Steam when it’s released. It’s a neat idea. In theory, anyway. In practice, Greenlight is just muddying the waters even more. Let’s deconstruct that two-sentence description of the Greenlight process and see how many holes we can poke in it, shall we? “People vote for the games they want to see on Steam.” Right, so here you have two problems. One is that votes on Greenlight will not necessarily equate to sales once the game is released, so Greenlight vote totals are rather fluffy indicators of a game’s potential commercial value at the best of times. The other is that the games running successful Greenlight campaigns are the ones which are able to grab a significant quantity of press exposure prior to their release which drive a constant stream of voters to their Greenlight pages. The number of people randomly trawling through Steam Greenlight looking for hidden gems is not large; it probably used to be larger, but I imagine some people have given up after being forced to rate the umpteenth 16-bit platformer “homage”/Slenderman game. (I know I certainly have.) If you want to experience success on Greenlight then you need that off-site exposure to make yourself shine amongst the huge, huge piles of dross that make up Greenlight submissions, and I think this is a problem because if you can rack up a substantial vote total entirely through off-site positive buzz then the chances are your game didn’t really need to go through the Greenlight process anyway. Looking at the forty-odd games that have been greenlit so far there’s maybe five of them that wouldn’t have had a decentl chance of making it onto Steam pre-Greenlight. That’s not a good hit rate. “Once a game has enough votes.” But what qualifies as enough? Nobody really seems to know. Pinball Arcade has been bouncing around the latter half of the top 100 ever since it was put up on Greenlight, but this has yet to convince Valve to let it onto the service. There certainly doesn’t seem to be any concrete threshold; I suspect that what there actually is are a couple of people at Valve who regularly check the top Greenlight games, using it as a way of reducing their sample size of games to curate rather than as a hard-and-fast indicator of what might be successful in the future. “they’ll give it a free pass and put it on Steam when it’s released.” Again, “when it’s released” is a rather nebulous term which exacerbates Steam’s already niggling problem with quality control. You see, for a service which is apparently so exclusive, Valve has released some downright broken and/or unfinished games in the last year or two. You probably heard about The War Z being yanked from the service a couple of months back for being blatantly unfinished; space 4X Legends of Pegasus suffered a similar (if less conspicuous) fate in September 2012 and is highly unlikely to return after the developer went out of business, while Sword of the Stars 2 – a game released on Steam in October 2011 – was finally given an “all clear” rating by the developer (i.e. they considered it to be finished, although I understand many of the people who bought it disagree) a full year later in October 2012. These are all games which did not go through Greenlight and which if anything illustrate the problem with Valve continuing to handle Steam submissions themselves; things like this are going to happen when you have so many games and so few people dealing with them. Greenlight won’t solve that problem, though. Towns was one of the first games to get greenlit and it showed up on the Steam store scant days later, which I must say surprised me greatly because I’d found the game on a random trawl of Desura a month or two beforehand and it was clearly labelled with a version number that was substantially less than 1.0. Unless the developers had managed to rush it out of its beta state inside of a month it was highly unlikely that what was on the Steam store was actually the finished article, and it was more likely that they’d just shoved their current build up on the Steam store in an attempt to bring in some money. Even though Towns is described as “continually being developed and updated to bring you the best experience possible!” I found this a rather shady business tactic to say the least, and steered well clear even though it looks like the sort of game that would otherwise be right up my alley. From what I’ve read on forums and whatnot following Towns’ release, I made the right move. 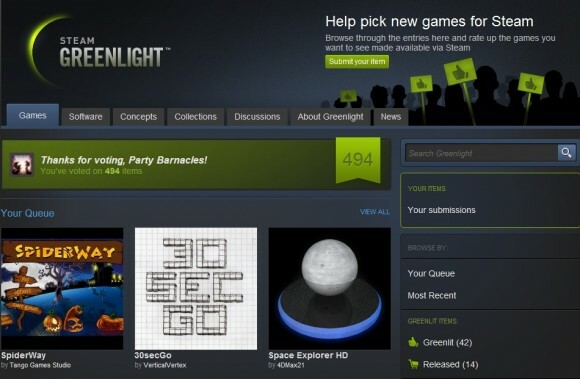 So Greenlight as it stands does not solve any of the problems with the Steam submission process. All it does is add an additional hoop for indie developers to jump through which makes Valve’s job substantially easier – since they no longer have to look at every game submitted to the service, just the highest rated ones on Greenlight – but which can hardly be said to be opening up Steam to all and sundry. The weirdest thing about Greenlight, though, is that it seems to run in parallel with the regular Steam submission process rather than replacing it. 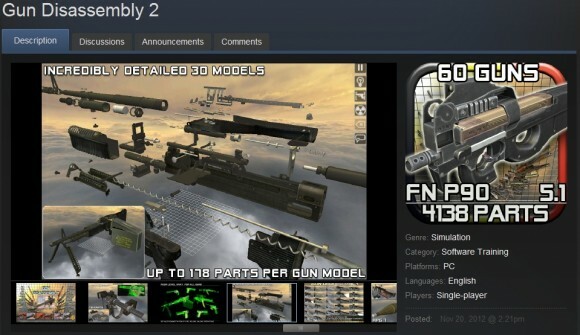 I wouldn’t expect Ubisoft or Activision to have to submit their games to Greenlight, but I must confess to being slightly puzzled as to how this masterpiece managed to sidestep Greenlight and go straight to the New Releases list on the Steam store. 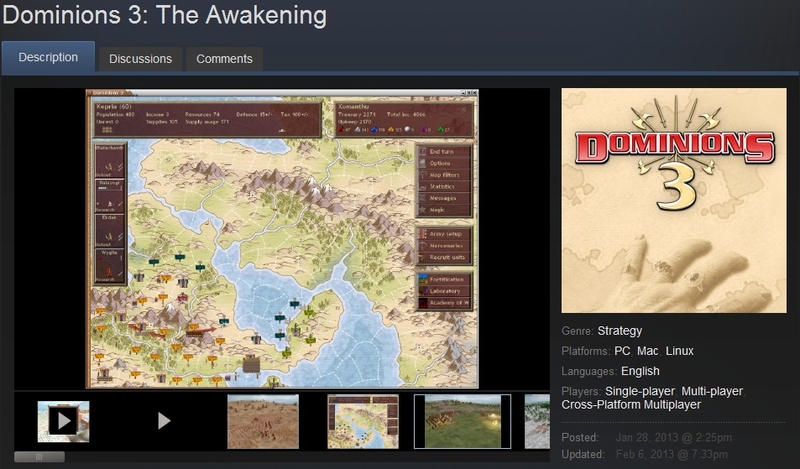 If anything, Greenlight has made getting your game on Steam an increasingly Byzantine process. To their credit it looks like there are people at Valve who know this, which is why they’re talking about (in an ideal universe) genuinely opening up the platform to anyone who wants to sell a game through it. This would throw any notion of quality control to the wind, but as we’ve seen Steam is inevitably trending that way anyway, so it may be just as well. And hey, Valve would still have some oversight of the service through dint of running it. They’re not going to give up their money machine that easily. Yes, I remember the Space Cadet table! I also have a lot of fond memories of playing various pinball games with my mother. I keep meaning to pick some up on GoG, but I haven’t got round to it or decided which one(s). I agree that the current system is a weird hybrid and probably not going to be around long in its current state. It was weird to realise that, strictly speaking at least, Clockwork Empires would have to be greenlit even though Dredmor was quite successful on Steam. I don’t have any bright ideas on what’s going to happen next. It’d be nice if they curated things better so that you had a higher chance of finding good stuff that might be up your street, but I guess this is where the social stuff is supposed to come in (for people who aren’t allergic to it). The Pro Pinball games on GoG are supposed to be quite good, but I’m not sure they’re $6 per table good. Doesn’t look like Pinball Arcade is going to make it onto PC, though, so it may be time to start looking for my fix elsewhere. That or buy an iPad to play it on. And yeah, it would be weird if Clockwork Empires had to go through Greenlight when Dredmor sold so well. As it is it probably won’t have to, and I have no problem with that seeming double standard, but it does create this two tier system where if you’re lucky you don’t have to bother with the palaver of Greenlight that everyone else has to subject themselves to with slim chances of success. Also, their curation has improved *slightly* since Greenlight was introduced. Or at least it looks like it has to me; there’s been a huge purge of Slenderman games, for example. The average (seeming) quality of games I see on Greenlight has gotten better — which makes it all the more odd that most of them will never make it through the system.